veg·​an | \ˈvē-gən : a strict vegetarian who consumes no food that comes from animals. This is one of the simplest treats you can make, albeit messy as hell to make - I had chocolate everywhere in my kitchen when I was through. Literally if you were speedy, you can whip this out in 10 to 15 minutes and then it is just a matter of setting the chocolate for at least 30 minutes in the freezer. And while the time required is minimal, the result looks fancy and will make any occasion feel extra special. Try adding pastel colored sprinkles for the perfect Easter treat! This same technique can be applied to fruit and cookies too. 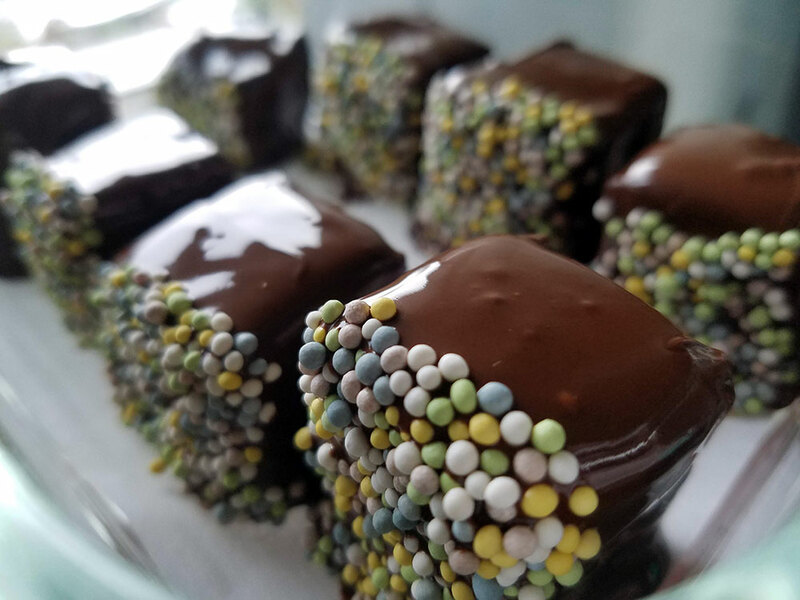 So if marshmallows aren't your thing, or you want to make a mixed chocolate covered concoctions platter for an event, go for it! One of my other favorites to do, is Oreo cookies or fresh mandarin slices, both of which are a real crowd pleaser. I use organic vegan ingredients when possible. I recommend trying Smash Mallows gourmet marshmallows in a variety of flavors as they can really up your chocolate covered marshmallow game - think strawberries and cream or chocolate chip mint marshmallows topped with chocolate, YUM! When in doubt, classic vanilla marshmallows are always a winner. Opt for vegan chocolate chips to get a better quality chocolate with less additives and pure chocolate as the main ingredient. Check your labels, many chocolate chips are made from chocolate liqueur or other processed chocolate products and will not provide as good end results. Pure chocolate will harden best and provide you with the crisp, snap on the outside of your soft marshmallow - just what you want. In a large glass bowl (microwave safe), melt chocolate chips in 30 second intervals, stirring between. Don't overcook the chocolate or it will taste burnt. You want to microwave just till there are a few chips still un-melted, stir the mixture well to completely melt all the remaining chips for the best "snap" on your chocolate and to avoid any burnt taste. Usually total melt time is between 60 - 90 seconds, in three sessions of 30 seconds each. Meanwhile, line a freezer safe container (I use glass meal prep containers) with parchment paper. Cut to fit. Roll your marshmallows in the chocolate mixture till coated, use a toothpick to remove the marshmallow, let drip well to remove excess chocolate and then place on the parchment. Continue with all your marshmallows, leaving room between marshmallows so they don't stick or clump together. If adding an optional topping, roll or dip warm chocolate covered marshmallows in sprinkles or crushed cookies of your choosing. Once you have all your marshmallows coated, cover and carefully place in refrigerator for 10 minutes to begin hardening (this step helps you avoid the marshmallows rolling into each other and clumping together). Next, transfer to freezer for 2 hours to harden completely. Serve at room temperature or slightly chilled. Store leftovers in airtight container at room temperature for up to 2 weeks or in the refrigerator for up to one month. : a strict vegetarian who consumes no food (such as meat, eggs, honey or dairy products) that comes from animals.